Fifteen NGOs with a presence in Colombia have expressed concern about the way in which humanitarian aid is going to Venezuela from the neighboring country and warned about the "risks" of their "political use". "We are concerned about the mechanisms through which we are planning to send humanitarian aid to Venezuela from Colombia (...) We warn about the risks of the political use of aid and the danger that this may imply for the people who receive the aid", the Humanitarian NGO Forum in Colombia, said in a statement on Friday, night February 8. Fifteen NGOs with a presence in Colombia expressed concern about the way in which they are planning to send humanitarian aid to Venezuela from the neighboring country and warned about the "risks" of their "political use". "We are concerned about the mechanisms through which we are planning to send humanitarian aid to Venezuela from Colombia (...) We warn about the risks of the political use of aid and the danger that this may imply for the people who receive the aid", the Humanitarian NGO Forum in Colombia, announced on Friday night, said in a statement. Formed of NGOs such as Doctors Without Borders Oxfam and Save the Children, the forum made "an appeal to the States" to preserve "the humanitarian character of aid in order to save lives", insisting on its "civil (non-military) character.) ". A shipment of medicines and food sent by Washington arrived on Thursday to the border city of Cúcuta (Colombia), where a storage center was installed near the international Tienditas bridge, blocked by the Venezuelan military with two containers and a cistern. Venezuelan President Nicolás Maduro said he would not allow the "show" of the "false" humanitarian aid requested by the opposition Juan Guaidó from the United States, recognized as interim president by some 50 countries. 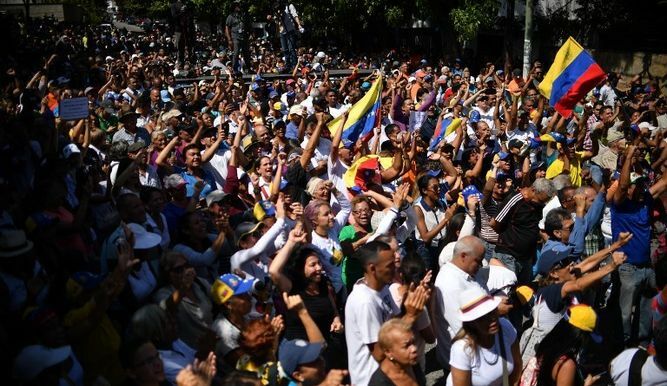 In response, Guaidó warned that he will do "what is necessary" to "save lives," without ruling out the intervention of a foreign force while calling on the military not to block the entry of humanitarian shipments. He has also threatened to use “volunteers” to access and deliver the US aid. Venezuela is mired in the worst crisis in its modern history, which has caused an exodus of some three million people since 2015, according to the UN. Colombia has received more than one million Venezuelan migrants in recent years.